Perugia is the largest city in Umbria, and is the capital of the province of Perugia. The historic center of the city has a medieval feel to it but is actually based on Etruscan plans. The city symbol is the griffin, which can be seen in the form of plaques and statues on buildings around the city. Perugia today has a cosmopolitan feel to it compared to other cities in the region and is famous for it’s world class jazz festival, it’s University for Foreigners, and it’s chocolates and pastries. How To Get To Perugia – The best approach to the city is by train. Perugia’s main train station is named “Stazione Fontivegge,” and is located on Piazza Vittorio Veneto, a few kilometres west of the city centre, but buses are frequent from the station to Piazza d’Italia, the heart of old town. Another option of travel is by bus. Intercity buses from surrounding areas in Umbria are both frequent and inexpensive. If traveling by car from the south, exit the A1 at the Orte and follow the signs for Terni. Once there, take the SS3bis/E45 for Perugia. From the north, exit the A1 at Valdichiana and take SS75 for Perugia. Founded by the Etruscans in 5th century BC, Perugia soon fell to Roman conquer in 309 BC. Almost immediately after, the city was caught between the power struggles of two Roman rulers, and was burned and destroyed in 140 BC. The city was slowly rebuilt during the Middle Ages during which time the city was incorporated in the Papal States. The city remained under papal control for almost three centuries, gaining its independence when the troops of Victor Emmanuel II Of Savoy (1820-1878) conquered the city and unified the entire Italian peninsula. Perugia’s hilltop position has enabled the city to be on of the best-preserved hill towns of its size, and few other places in Italy better exemplify the medieval self-contained city state that helped shape the course of Italian history. What To See In Perugia - Perugia occupies an important position on top of a series of hills near the Tiber River which helps explain how the city has remained almost completely intact. 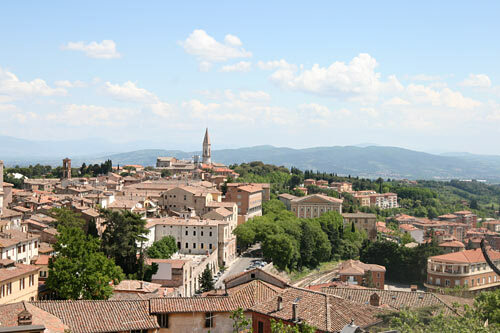 Most of the most important sites to see in Perugia are within it’s historical center and can be reached by walking. The Palazzo Dei Priori is partly situated in the main square on the northern end of Corso Vannucci, the street named after the most important Perugian painter of the Renaissance, Pietro Vannucci. Its construction began in 1293 and was completed in 1442. It is often cited as Italy’s most impressive civic place and houses four separate buildings hidden in its grounds; the Sala dei Notari, Sala del Collegio della Mercanzia, Collegio del Cambio and the Galleria Nazionale dell’Umbria. The Sala dei Notari is one of the oldest parts of the palazzo, dating back to the early 13th century. Before it was used as a medieval lawyer’s meeting hall, it was used as a meeting place for townspeople in time of crisis and decision. The Sala del Collegio della Mercanzia, a room of carved wood reveals intricate wooden paneling that is considered as one of the finest examples of 15th century wooden work throughout Italy. It was the original meeting room for merchants, especially fabric traders. The Collegio del Cambio is located on the ground floor of the palazzo and served as the meeting hall and chapel of the guild of bankers and moneychangers. Its walls are covered with frescoes done by Pietro Vannucci, better know as Perugino, which are reckoned to be one the best-preserved Renaissance schemes in the country. The National Gallery of Umbria is located on the fourth floor of the Palazzo dei Priori and was established in 1863 and is the region’s main repository of Umbrian art. Situated in the Piazza Forebraccio is the Acro di Augusto (Arch of Augustus). Dating from 3rd century BC, this arch was the main entrance to the Etruscan and Roman acropolis. Located in the same square is the Universita per Stranieri (University for Foreigners). Also called the Cathedral of San Lorenzo, the Duomo, is most famous for being the home of the wedding ring of the Virgin Mary. It is located in the main square and was built between the years 1437 to 1587. Outside the Duomo is the Fontana Maggiore, which was built prior to the Duomo in 1287, and is adorned with zodiac figures and symbols of the seven arts. Every July Perugia plays host to Italy’s foremost Jazz festival, Umbria Jazz, whose stars have included Miles Davis, Stan Getz and Wynton Marsalis. During this two-week festival hundreds of concerts all over the town of Perugia offer a musical variety rarely seen and heard elsewhere. In mid- to late September, Perugia hosts Sagra Musicale Umbra, one of the oldest music festivals in Europe that features world reknown conductors and musicians. In the month of October, Perugia welcomes the weeklong festival entitled Eurochocolate. Stalls and vendors line the streets of Perugia, offering the public their best creation. Films are show, workshops and competitions are held, and exhibitions are opened; all in the spirit of chocolate. Every year the event increases in intensity and participation from the public. In November in Pian Massiano is the Fiera dei Morti, the oldest fair in Italy. Saturday mornings in the Pian di Massiano. Daily markets near the Kennedy escalator off Piazza Matteoti. Open 8-12am and 4pm until sunset. The main tourist office is at Piazza IV Novembre under the arches near the flight of steps and behind the fountain.